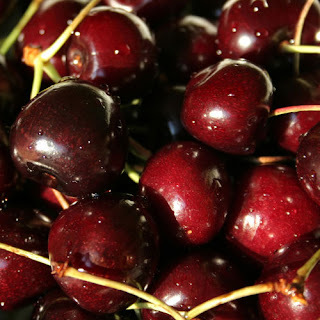 Robin's Eccentricities: Cherries, cherries and more cherries! I really thought that 20 pounds of cherries would be no big deal. What I discovered today is that it is indeed a big deal and was more than I could do in one day. Well, perhaps I could have accomplished it all had I not had anything else to do. Add into that the fact that I had absolutely no alum in the house which was needed to make the brine for maraschino cherries. That required a trip into town which takes up well over an hour. No quick trips to the store around here. What I did accomplish was 5 pints of cherry pie filling, 12 half pints of fruit cocktail, 7 4oz jars of reduced sugar cherry jam. I have another 3 pounds of cherries in brine soaking to become maraschino cherries tomorrow. I believe I am down to about 8 pounds of cherries to pit yet. Most of those will become cherry pie filling. For the cherry jam I just use flex batch pectin. It's super easy and only takes minutes (not counting processing time) to make. LOVE making jams! The fruit cocktail was simply some peaches, pineapple, grapes and cherries in a light syrup. Store bought fruit cocktail uses maraschino cherries but since my husband doesn't like them we just used sweet cherries. Tomorrow as I finish the maraschino cherries I will post how to make your own. Until then, have a great evening.